February 13, 2006 | SMITHFIELD -- The journey up the driveway is deceptive; the house does not appear that large from the road, but according to its owner, Smithfield resident Tom Worthen, that was one of the goals. "We wanted a place that would be everything we wanted, but not look like it as that big," Worthen said. The 10 acres of land that the house is situated on are also home to a view of the mountains, a creek, and Worthen's current house, which he said will be converted to a guest home when his new house is done. "When Gaylen and I moved here, we came from Oregon and wanted someplace with trees. So we drove every road from Cove to Paradise, and decided we really liked this spot. A week later it was put up for sale and we grabbed it," Worthen said. Among the many comforts the house will offer when finished are a swimming pool, basketball court, theater, game room, elevator, and treehouse. Worthen said the house is built to accommodate the needs of his family and job. The entire home is handicap accessible and has an elevator so older relatives don't have a hard time getting around, and because of an undiagnosed muscle condition his daughter Annie has, which makes it impossible for her to climb stairs or do much physical activity, Worthen said. Love and consideration for his family is evident in the design of the house. "Annie will never be able to climb a tree, so I did the next best thing," Worthen said, in reference to the treehouse that is built inside his home. 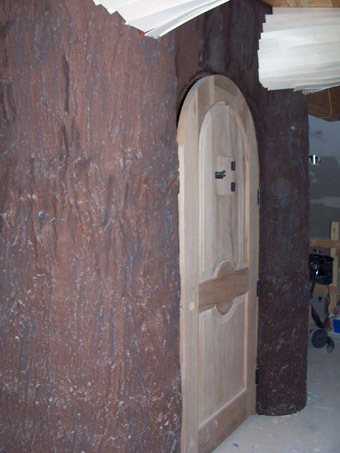 Worthen said a company in Salt Lake City made molds of real trees to create realistic bark for the trunk, and leaves and branches will be applied to the tree to make it realistic. The elevator is at the core of the trunk, making it possible for his daughter to play in the tree. "Even though the house is large, we designed it to be very open," Worthen said. "Nothing's really isolated, because if Annie falls down we have to be able to hear her. The way the bedrooms are designed also allows for Annie and his son Jarren to easily play together. "They really enjoy spending time together, and so we made it so their bedrooms will open up into a central playroom," Worthen said. The house also contains a wing with a recreation room and bedrooms for Worthen's teenage children, Tim and Kyrsti. "When debate starts up again this is probably where we will hold practice rounds," Worthen said, talking about his role as volunteer coach for the Utah State University speech and debate team. Worthen, known as Dr. Tom to students and employees, said he thinks the new house will be a good place for the team to work in a more informal setting. The home is also designed to accommodate older relatives, Worthen said. The "in-law suite" is built to provide independence for any of his relatives that need to stay with him, Worthen said, while still allowing them to be part of the family. An extra long dining room was built for family gatherings, Worthen said, because his wife Gaylen "has 48 people in her extended family." Worthen said offices for both him and Gaylen are part of the plan as well. Dr. Tom and Gaylen Worthen own the Logan business Creative Communications, and need a place to work at home. Gaylen Worthen's office also has a balcony to provide good light for the artwork she does, Worthen said. Worthen said the first time he didn't live in a trailer was when he moved to college and that Gaylen Worthen has 13 siblings which made her childhood home crowded too. "I guess we overcompensated," Worthen said, joking. 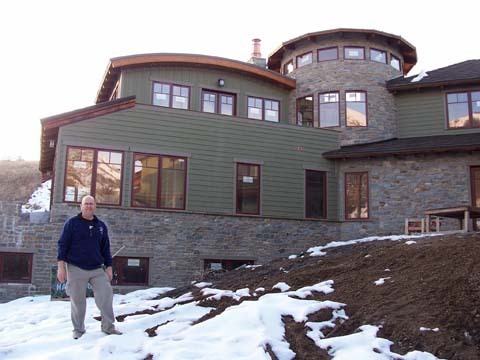 The building is home to many unusual features such as three tulikivis, a soapstone fireplace from Finland, which Worthen said will heat the house for 24 hours with just one fire, because he gathered the materials and then found a contractor to assemble them, instead of the other way around. Worthen said the heating and lights in the house are completely automated, allowing them to be controlled from the Internet and the controls for the new house and his current one will be linked. "It will just be a great place for the kids to play and hang out and for family and friends to come over," Worthen said. He said the home should be done by August.